It must be said that the C2C Festival phenomenal success and his organization has a growing similarity with the CMA Music Festival in Nashville. Seing more and more artists from Music City, the other name given to Nashville, coming to England, and generally this side of the pond seemed hard to believe only a few years ago. For this third edition, fans went from all over Europe, even if the English are present in numbers because this coverage is centered on the London weekend. But Dublin, Oslo and Stockholm are also planned, and we already know that the edition 2016 will take place over three days due to an overwhelming demand. The number of pop-up stages, film screenings, discussions Q & A (questions / answers) increase, the satellite stage in the venue, the incredible line-up of stars from Nashville, the event has definitely a bigger configuration each year. 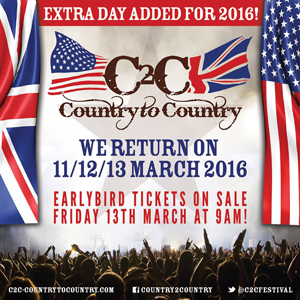 C2C 2015 Festival begins this Saturday with the perfect artist at this position since Brandy Clark offers us a very nice contemporary folk. Alan Jackson asked her to be his opening act, which is not given to everyone. She is already well known as a lyricist and wrote "Follow your arrow" (CMA Song of the Year 2014) for Kacey Musgraves and "Better dig two" for The Band Perry (C2C 2014) and "Mama's broken heart" to Miranda Lambert. These last two songs have reached the number one spot on the Billboard country singles and Brandy proposed them to the public of the O2 in London in an acoustic version. "Strikes", "What'll keep me out of heaven" and "Hold my hand" were also interpreted, and her second album is expected very soon. It was a great idea to schedule LeeAnn Womack just before Florida Georgia Line. 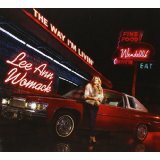 LeeAnn is still more than ever a sure value of traditional country and rehear "I hope you dance", "Twenty years and two husbands ago" and "I'll think of a reason later" and "Ashes by Now" was a return to the popular past. The latest album "The way I'm livin '" was on the set with some gospel songs, a major style in country music and the singer was accompanied by a mandolin. No doubt, "I hope you dance" was a magical moment and there were lights everywhere in the room to witness the emotion and memories that inspired the title. The Florida Georgia Line duo, Tyler Hubbarb (from Georgia) and Brian Kelly (from Florida) offers a very energetic music, not in the rock definition but with the aim of dancing, have fun, to party!!! They met at Belmont University in Nashville and spent part of their time writing songs between classes. I faint at their first track "Cruise" which became a huge hit and is a sort of anthem, also "Dirt" and "Sun daze" among others. To say that their career is recent is an understatement, but they really reach the young people, and it is obvious that this age group has a pop-rock culture that fully explains the success of the duo. To this we must not forget that their two albums to date include pedal steel, banjo, mandolin, dobro, and even bouzouki on the second one. On stage, of course, is the energy of their sound which causes the audience to dance all the time and their latest album "Anything goes" launched their show with "Every Night" and "This is how we roll" in the setlist. I was definitely not the only person waiting for "Cruise" and the planetary hit closed the show making a very good transition for the arrival of Luke Bryan. I had seen Luke Bryan at LP Field during CMA Music Festival and it was a great pleasure to see him at the O2 as it is a different context in the sense it's a concert hall with perfect acoustics. Luke had just been elected Entertainer of the year in late November at CMA awards, and his talent has grown over and over. He has a natural ability to capture the whole scene, and even when he is with his guitar, communion with the audience is total. "That's my kinda night", "Do I", "Dring a beer", "Rain is a good thing", "Kiss Tomorrow Goodbye" and "Country Girl (Shake it for me" are some of his hits. In fact, "Drink a beer" was a very special moment because the title is a thought to those we love and we lost. If Luke Bryan has the talent for making people dance, he may also be in a quiet position and transmit a conviviality that brings together all the fans. Towards the end of the show, it was a return to the dancefloor with "Drunk on You" and "I do not want this night to end", then "I see you "and" Country girl "for the encore. Kip Moore is certainly the artist that I expected the most, and I was even more eager to see him on stage after the interview. The reason is simple: Kip Moore talked about his influences, and cited rock and classic rock of the 80s mentioning Bob Seger, Jackson Browne and Bruce Springsteen. He opened this Sunday evening with a new title "Wild ones" and "crazy one more time" with a great playing of guitar in an atmosphere that was acquired to him, especially when he resumed the last words of "Reckless (Still growing up)", and for "Hey pretty girl "all the public knows very well each word. As did other artists at C2C, Kip Moore covered a song, here "Do not look back in anger" from Oasis and asked the audience to sing the last chorus. It was a big surprise for him to hear the public's reaction totally involved and Kip Moore invited fans to meet him in the lobby of the O2 to sign autographs after his show. The line went far beyond the dome. Kip Moore has only one album but is already on the path of future superstars of country music. 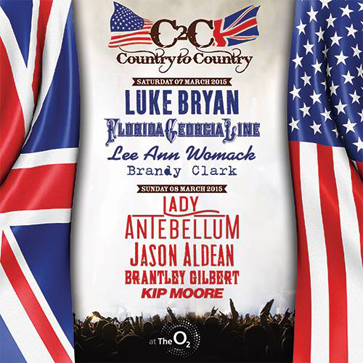 Brantley Gilbert is the first artist who returns to C2C Festival. He was present at the first edition in 2013, and his style is rock in coherence with his look, even if his new and second album is more melodic than his first songs. "Bottoms up" is a great title, and a few seconds of covering "Sweet child of mine" by Guns N Roses before moving on to "My baby's guns and roses" were a surprise but we remained frustrated because he did not sing the entire title. 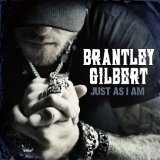 With Brantley Gilbert, we enters the world of bikers, among others, and he also appears on the very interesting album Nashville Outlaws. He sang "Read me my rights" that evokes the arms and turned to show the back of his shirt where a couple are tattooed to the public. Brantley said he had come with his fiancée and proposed "You do not know her like I do," and the concert ended with "Small town throwdown" and "Bottoms up" two really good songs. Jason Aldean concert will remain a good souvenir. The background screen on stage was lit up with fire, and the presence of a pedal steel was a good surprise, because his songs have this instrument. "Hicktown", "Night Train," "Dirt Road Anthem" and "My kinda party" with a very good solo from his guitarist, "Tattoos on this town," "Fly over states", the latter being very well supported by videos too on the screen back of the stage and that boosted the show and the fans. A real fireworks video was therefore synchronized to offer a spectacular effect. At the end of the show, Jason Aldean left the stage and the group continued to play. 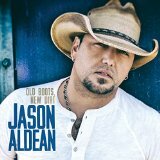 "Old boots, new dirt" is his current CD. The headliner of C2C 2015 already knows very well London, and I saw them several times in concert. On each occasion, it was a really great night. 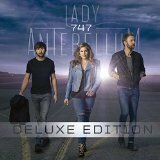 Lady Antebellum has an impressive number of hits, and from "Need you now" to "Bartender", the audience was treated with a magnificent concert with very friendly stage presence from Hilary Scott, Charles Kelley and Dave Haywood. In return, Charles Kelley made it clear that playing the O2 London was very important in their career. He also took time to explain the formation of the group, he and Haywood met in their hometown, and Kelley had met Scott in a bar in Nashville. The group took over "Islands in the Stream" from Kenny Rogers and Dolly Parton regarding her recent huge success during her European tour. The beautiful ballad "One great mystery"followed, then an acoustic sequence and "Own the Night" for the end of the show, but the audience did not want to leave the venue and wanted more! The band is so close to his fans as Charles Kelley went down into the pit to dance a little. For the encore, Dave Haywood sat at the piano joined by his two friends for "Need you now ". The future is very positive and the strong demand from fans makes the edition 2016 will take place over three days on march 11, 12 and 13. Il faut bien dire que le C2C Festival a un succès phénoménal et par son organisation se rapproche volontairemet du CMA Music Festival de Nashville. Voir de plus en plus d'artistes de Music City, l'autre nom donné à Nashville, venir en Angleterre, et plus généralement de ce côté du pond, semblait difficile à croire il y a à peine quelques années. Pour cette troisième édition, les fans viennent d'un peu partout en Europe, même si les anglais sont présents en nombre puisque ce reportage est centré sur le weekend londonien. Mais Dublin, Oslo et Stockholm sont aussi au programme, et l'on sait d'ores et déjà que l'édition 2016 se déroulera sur trois jours en raison de la demande du public. Le nombre de scènes ouvertes, de projections ciné et de discussions Q&A (questions/réponses) augmentent, et avec le magnifique plateau principal de stars venant de Nashville, l'événement prend une nouvelle dimension chaque année. Le C2C Festival 2015 débute ce samedi avec l'artiste idéale à cette position puisque Brandy Clark nous propose un folk contemporain très agréable. Alan Jackson lui a demandé de tourner avec elle, ce qui n'est pas donné à tout le monde. Elle est déjà très connue en tant que parolière et a écrit "Follow your arrow" (CMA Song of the year 2014) pour Kacey Musgraves, puis "Better dig two" pour The Band Perry (C2C 2014) et "Mama's broken heart" pour Miranda Lambert. 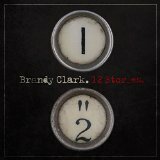 Ces deux dernières chansons ont atteint la première place du Billboard country singles, et Brandy les a proposées au public de la O2 London en version acoustique. "Strikes", "What'll keep me out of heaven" et 'Hold my hand" furent aussi interprétés, et on attend son second album pour très bientôt. Ce fut une excellente idée de programmer LeeAnn Womack juste avant Florida Georgia Line. LeeAnn est toujours et plus que jamais une valeur sûre de la country traditionnelle, et réentendre "I hope you dance", "Twenty years and two husbands ago" et "I'll think of a reason later" et "Ashes by now" fut un retour vers le passé très apprécié. Le dernier album "The way I'm livin'" fut évoqué avec certains titres gospel, une racine majeure de la country music, et la chanteuse était accompagnée d'une mandoline. Nul doute que "I hope you dance" fut un moment magique et il y avaient des lumières partout dans la salle pour témoigner de l'émotion et des souvenirs que ce titre inspire. Le duo Florida Georgia Line, Tyler Hubbarb (Georgia) et Brian Kelly (Florida) propose une musique très énergique, non pas dans le sens rock, mais avec le but de faire danser, de s'éclater, to party comme disent les anglo-saxons. Ils se sont rencontrés à la Belmont University de Nashville et passaient une partie de leur temps à écrire des chansons entre les cours. J'avais bien accroché à leur premier titre "Cruise" qui est devenu un énorme hit et qui conclu leur show comme une sorte d'hymne, mais aussi à "Dirt" et "Sun daze" entre autre. Dire que leur carrière est récente est un euphémisme, mais ils font réellement un carton auprès des jeunes, et il est bien évident que cette tranche d'âge a une culture pop-rock qui explique pleinement le succès du duo. A cela, il ne faut pas oublier que leur deux albums à ce jour proposent de la pedal steel, du banjo, de la mandoline, du dobro, et même du Bouzouki sur le secon CD. 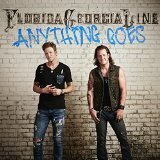 Sur scène, bien sûr, c'est l'énergie de leur son qui entraine le public à danser et leur dernier album en date "Anything goes" a lancé leur show avec "Every night", et "This is how we roll" dans la setlist. J'avais déjà vu Luke Bryan au LP Field durant le CMA Music Festival et ce fut un grand plaisir de le revoir à la O2 car c'est un contexte différent dans la mesure ou c'est une salle de concert avec une parfaite acoustique. Luke venait d'être élu Entertainer of the year fin novembre, et son talent n'a fait que croître au fil du temps. Il a une facilité naturelle a s'emparer de toute la scène, et même lorsqu'il est avec sa guitare, la communion avec le public est totale. "That's my kinda night", "Do I", "Dring a beer", "Rain is a good thing", "Kiss tomorrow goodbye" et "Country girl (Shake it for me" représentent une partie de sa kyrielle de hits. En fait, "Drink a beer" fut un moment très particulier car le titre est une pensée à ceux que nous aimons et que nous avons perdu. 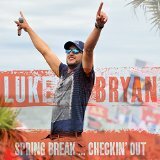 Si Luke Bryan a un don pour faire danser le public, il peut aussi à ses moment-là être dans une quiétude et transmettre une convivialité qui rassemble tout le public. Vers la fin du show, ce fut un retour au dancefloor avec "Drunk on you" et "I don't want this night to end", puis "I see you" et "Country girl" pour le rappel. Kip Moore est certainement l'artiste que j'attendais le plus, et j'étais encore plus pressé de le voir sur scène après l'interview. La raison est simple: Kip Moore évoquait ses influences, et citait le rock et le classic rock des années 80 en mentionnant Bob Seger, Jackson Browne et Bruce Springsteen. C'est lui qui ouvrait cette soirée du dimanche avec un nouveau titre "Wild ones", puis "crazy one more time" très marqué de guitare, dans une ambiance qui lui était acquise, surtout lorsqu'il a repris les derniers mots de "Reckless (Still growing up)" et "Hey pretty girl" que tout le public connait très bien. Comme d'autres artistes l'ont déjà fait lors du C2C, Kip Moore reprend une chanson qui n'est pas de lui, ici "Don't look back in anger" d'Oasis et demande au public de chanter les derniers choeurs. 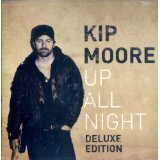 Ce fut une grande surprise pour lui d'entendre la réaction du public totalement impliqué, et Kip Moore a invité les fans à le retrouver dans le lobby de la O2 pour signer des autographes. La file allait loin au-delà du dôme. Il n'a qu'un album mais est déjà sur la voie des futures grandes stars de la country music. Brantley Gilbert est le premier artiste qui revient une seconde fois au C2C Festival. Il était présent lors de la première édition en 2013 et son style est résolument rock en cohérence avec son look, bien que son nouveau et second album soit plus mélodique que ses premiers titres. "Bottoms up" est un superbe titre, et les quelques secondes de reprise de "Sweet child of mine" de Guns N Roses pour enchainer sur "My baby's guns and roses" furent une bonne surprise mais nous sommes restés frustrés car il n'a pas repris le titre en entier. Avec Brantley Gilbert, on entre dans le monde des bikers, entre autre, et il a d'ailleurs collaboré à l'album Nashville Outlaws. Il a chanté aussi "Read me my rights" qui évoque les armes et s'est retourné pour montré au public l'arrière son t-shirt ou sont tatouées deux armes. Brantley a dit qu'il était venu avec sa fiancée et a proposé "You don't know her like I do", et la fin du concert avec "Small town throwdown" et "Bottoms up". Le concert de Jason Aldean restera un bon souvenir . Ses derniers albums sont meilleurs que les premiers, et globalement le show fut de bonne qualité. L'écran de fond de scène était illuminé de feu, et la présence d'une pedal steel fut une excellente surprise. "Hicktown", "Night train", "Dirt road anthem" et "My kinda party" avec un très bon solo de son guitariste, "Tattoos on this town", "Fly over states", ce dernier étant supporté par des vidéos aussi sur le fond de scène qui dynamisaient le show et galvanisaient les fans. Un vrai spectacle pyrotechnique en vidéo était donc synchronisé avec les prestations de Jason Aldean. Pour la fin du show, la star avait quitté la scène et le groupe continuait à jouer. La tête d'affiche du C2C 2015 est déjà venue à Londres, et je les ai vu plusieurs fois en concert. A chaque occasion, ce fut d'excellentes soirées. Lady Antebellum a un parcours impressionnant, et de "Need you now" à "Bartender", le public a eu droit à un concert magnifique avec la présence scénique très conviviale de Hilary Scott, Charles Kelley et Dave Haywood. En retour, Charles Kelley a bien fait comprendre que jouer à la O2 London était un aboutissement. Il a aussi pris le temps d'expliquer la formation du groupe, lui et Haywood se connaissant depuis leur ville d'origine, et Kelley ayant rencontré Scott dans un bar de Nashville. Le groupe a repris "Islands in the stream de Kenny Rogers et Dolly Parton. La superbe ballade "One great mystery" a suivi, puis une séquence acoustique et "Own the night" pour la fin du show, mais le public a très bien fait savoir qu'il en voulait plus! Le groupe est tellement proche de ses fans que Charles Kelley est descendu dans la fosse pour danser un peu. Pour le rappel, Dave Haywood s'est mis au piano rejoint par ses deux amis pour "Need you now". L'avenir est très positif et la forte demande des fans font que l'édition 2016 se déroulera sur trois jours: 11, 12 et 13 mars.